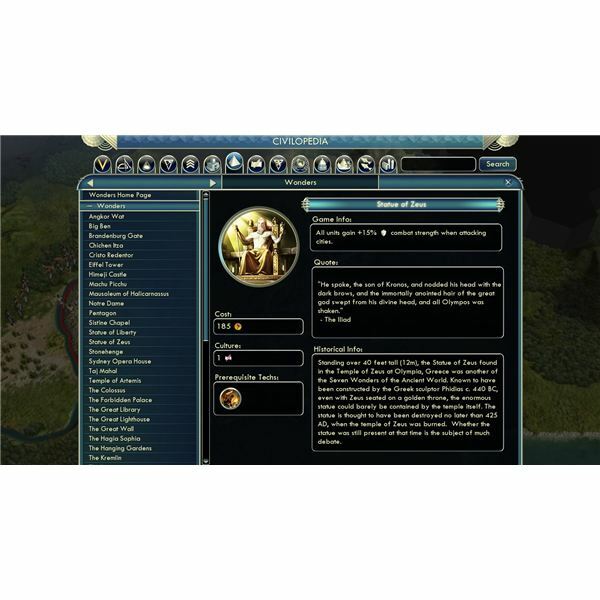 The first question is how the three new wonders in this Civilization V DLC will impact the balance of the game. Wonders are the parts of the game which have, in previous games, been most likely to create balance issues. In previous games, The Great Library has often been a problem. In this case the three wonders are balanced well enough that they are worth building yet won’t break the game. The first of the new wonders is The Statue of Zeus. This requires the bronze working technology and gives all of your units a 15 percent bonus when attacking cities. This can give a huge advantage for a conquering power early in the game, but it still only speeds up attacks on cities and won't help any in getting to those cities. The second is the Mausoleum of Halicarnassus. Available when you get the masonry technology, this wonder gives two gold for each stone and marble worked by the city. The other part of this ability of this is that it can give you 100 gold each time a great person is expended. This means that if you’re able to focus on great people you can get a quite a lot of gold with this wonder and it works well with the new Korean civilization from the Korea Scenario Pack. Third is the Temple of Artemis which can be built once you learn archery. When built it gives a 10 percent bonus to food in all cities as well as a 15 percent bonus in building ranged units. Since this will create larger cities that can build archers faster it can be very useful for the civilization that wants to focus on creating a mass of ranged attack units. It is limited though by the fact that early in the game players are generally low in happiness so cities are very limited in their size. Each of these can change the game considerably and allow an entire civilization to focus on a specific path so you can play the game in the way that you most want, thus allowing them to change the entire game. In addition to the three wonders in the main game, there is a scenario you can play as well. It is a large scenario and you can play as any of five civilizations which existed in the area around the original wonders of the ancient world. They are Ramesses II of Egypt, Gilgamesh of Sumer, Darius of Persia, Alexander of Greece and Muwatallis of the Hittites. You can play this on an inland sea map type or a historical map. The historical map is of the fertile crescent with the other civilizations you might expect to find here appearing as city states. The primary difference in this game is that the goal is to build the wonders of the ancient world. There are 9 wonders which can be built and the scenario ends when all nine of them have been built. At this time the person with the highest score wins. This will generally be the person who built the most wonders, but not always. The wonders are The Oracle, The Pyramids, The Hanging Gardens, the Great Library, the Colossus, the Great Lighthouse and the three newly added wonders. What makes this different is that you don’t research specific technologies in order to build these. Instead, each requires a specific goal. The Oracle can be built immediately. The others are broken into four groups that can be unlocked with cultural, scientific, economic or military advances. This allows you complete freedom in the technologies you learn while still forcing you to focus on which gameplay style you want and earning the right to build the wonders. At five dollars, the Wonders of the Ancient World Scenario Pack is not expensive, but it also adds far less to the game than any traditional expansion. The wonders themselves have a minor but noticeable effect on every game. Still, this isn’t likely to convince anyone who isn’t already playing to play more Civilization V, but for those already playing it is worthwhile. There are many free mods which add in buildings and wonders with just as much of an effect. The scenario helps as it has the potential to be played through a number of times using each of the civilizations which play very differently. This is because the starting locations and abilities of each of these civilizations change strategies and it really is fun to be able to play a longer game in the ancient era rather than simply rushing towards modern technology. This means that it probably does add five dollars worth of value to the game, but no more than that. While the Civilization V Wonders of the Ancient World Scenario Pack isn’t going to change the game significantly, if you are already a fan of the game it does add to the experience. The extra control the wonders can give over the way each civilization grows makes the game feel more open and the strategies more important. Still, this is small enough change that it feels a bit like paying for content that could be released in a free patch or player built mod. This stops the content from being highly rated for everyone, but it still has some value for those who are still playing Civilization V.